New Delhi: Over 20,000 nurses in government hospitals in Delhi on Friday went on an indefinite agitation to press for higher salary and allowances, even as the government decided to crack down on the agitation by invoking the Essential Services Maintenance Act (ESMA) against them. Around 80 nurses of Ram Manohar Lohia Hospital were detained by Delhi Police for going ahead with the strike. 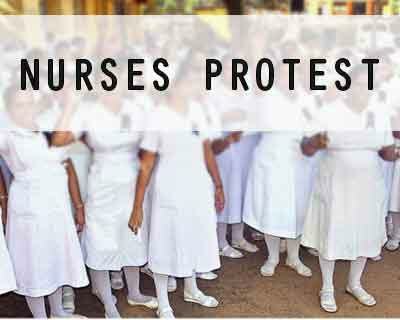 The nurses’ agitation is across the country, and affected hospital services badly. The Health Ministry said that more states are likely to invoke the ESMA act by Saturday, depending on the condition of hospitals. Under ESMA, police can arrest anybody for violating the act’s provisions without a warrant. According to the Government, the pan-India strike affected patient care in Delhi, Uttar Pradesh, Haryana and Punjab. Other states might also see the same effect in the coming days if the nurses do not report back to work. Risk and night duty allowances should be given to all nurses. “We do not have a problem even if we all are arrested. We are not going to come back to work if the government continues to ignore our demands. Several times we have delayed our strikes listening to the government. But not this time,” Liladhar Ramchandani, spokesperson AIGNF, told IANS. According to Manchandani, there is a feeling among officials that all the good and efficient nurses move out of India in pursuit of better pay scale and those left behind in India are of inferior quality, who can be minimally paid. Earlier during the day, the Health Ministry had said that all demands of the nurses have been acted upon by the government and further demands can also be considered. The ministry urged the nurses to get back to work and continue the talks. However, the nurses federation said they have not received any direct communication from the ministry on the issue. The statement also mentioned that instructions have been received from the Health Ministry to take all possible steps to make the nurses return to work, including invoking of ESMA. Govt. Should believe in thinking and implimenting appropriate measures once problems sre sounded – instead of sitting over the proposal and letting the strike to occur.